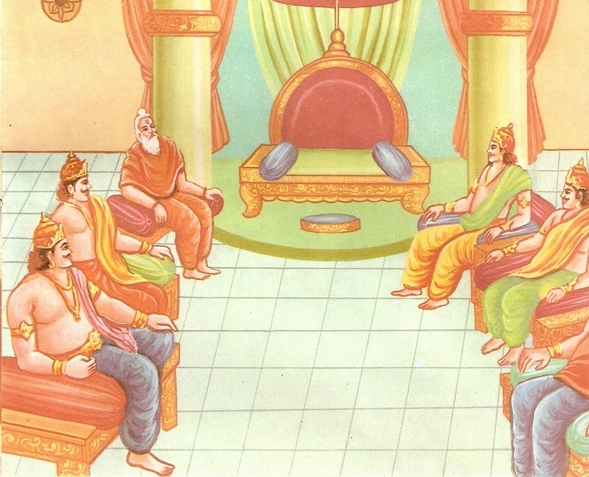 Sumant did as Ram had said and the chariot moved on with Ram, Lakshmana and Sita in it. Proceeding further, the chariot reached the northern bank of the Ganga. This region was under Nishadraj, the chief of the Nishads. 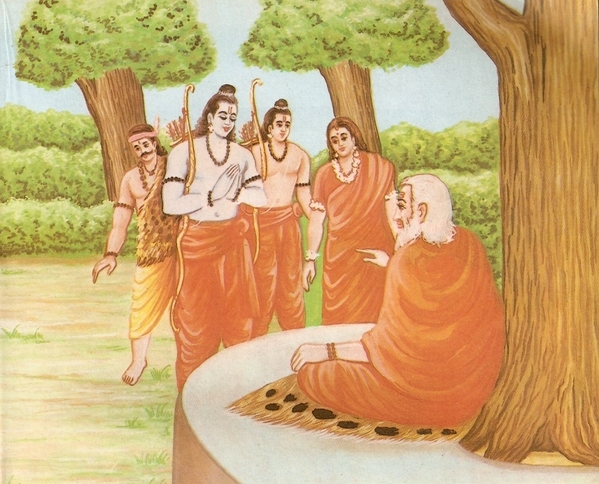 He was a class-mate of Ram at Saint Vasishtha’s hermitage. When he came to know of Ram’s arrival, his joy knew no bounds. He collected his chiefs and said, “Have you heard that my friend as well as master- Ram – has come. Let us go and receive him with open arms. Even a glance cast at his face is sure to rid us of all our sins and difficulties. 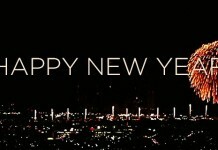 “Your love has won me over. Do a favour to me as well. Arrange for a boat so that we may cross the Ganga and get to its southern bank.” Saying so, Ram embraced Nishadraj. 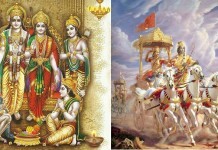 “I cant dare to return to Ayodhya with my chariot empty. 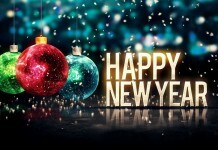 I have decided to stay in the forest and serve you day and night,” retorted Sumant. “I won’t let you step into my boat until I wash your feet.” Retorted the boatman. 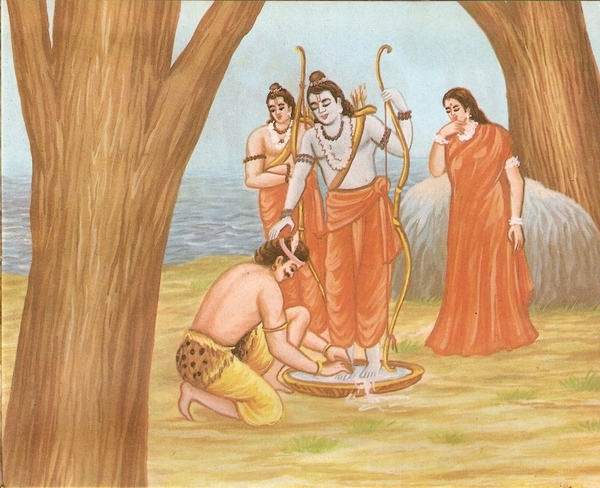 “All right; wash my feet and get us across at once,” said Ram. 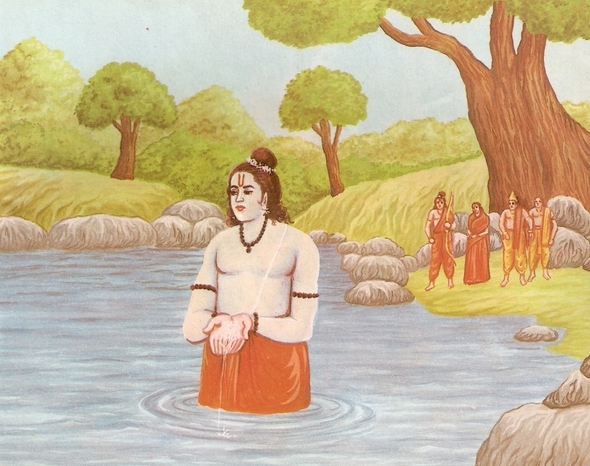 The boatman washed Ram’s feet with the water of the Ganga. 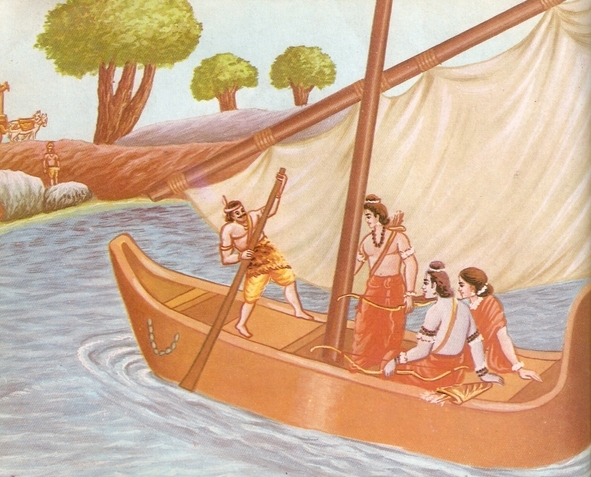 Having set his doubt at rest, the boatman made Ram, Lakshmana and Sita sit in his boat and began to row it towards the other bank. Nishadraj was also in the boat at that time. Ram, accompanied by his brother, wife and friend Nishadraj, crossed the dense forest and came to Prayag, a town at the confluence of Ganga and Yamuna. They visited the hermitage of Saint Bhardwaj who entertained them duly in every way. Then providing them seats to sit on, he said to Ram, “My meditation, seclusion and penance have attained completion today. My life has bloomed indeed to see you. No desire is left in my mind at all. So, taking leave of Saint Bhardwaj, Ram proceeded to Chitrakoot. 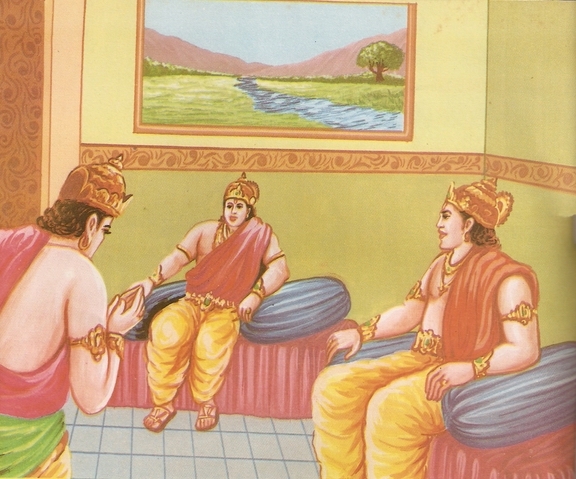 Sumanta, on reaching Ayodhya, left the empty chariot outside the town. He dared not enter the town as if he had been guilty of murdering a Brahmana, a saint or a cow. He could not take courage to go into the capital during the daytime. So, he passed the day under a big tree and entered the town at night under the cover of darkness. Saving himself from the eyes of the people, he made for the royal palace and was directed to Queen Kaushalya’s apartment by a maid. There King Dashrath was smarting under the sorrow of separation from his dear son. Bowing low, he greeted the king. Hearing this, Sumant broke into tears and no words could come out of his throat. 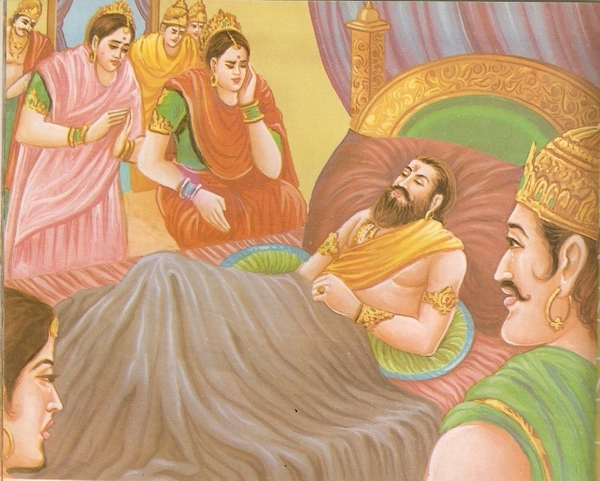 The king was, in fact, reminded of the curse inflicted on him by Shravana’s blind parents. 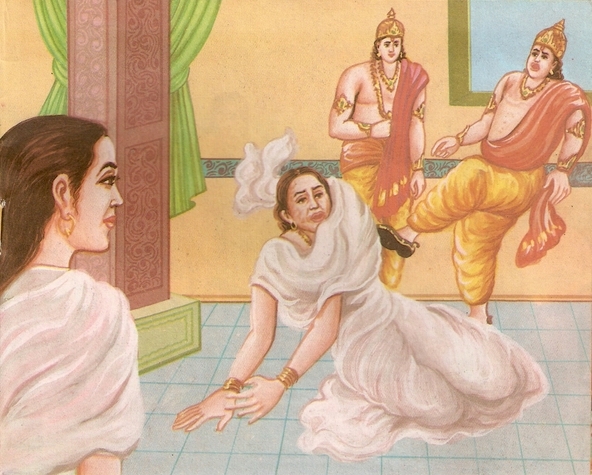 Queen Kaushalya, on hearing about the curse, insisted on knowing the story about the curse and the king began to narrate it. “At that time I had no son. So, I thought that the old couple had uttered a curse on me which will have no effect as I had no son then. 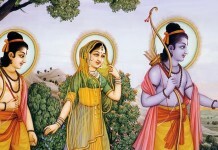 But now when Ram, Lakshmana and Sita are away to the forest, I have been reminded of the curse. I love Ram more than I love my life. He is away and I cannot survive without him. Death is staring me in my face indeed. 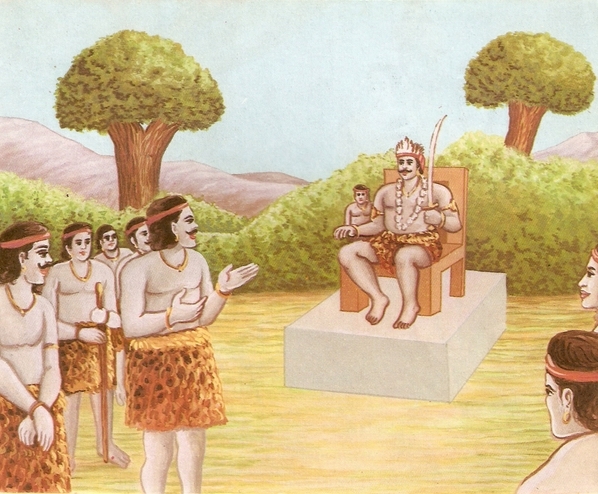 Having narrated the story of the curse to the queen, the king called out to Ram in a loud voice and then breathed his last. All the people began to curse Queen Kaikeyee. Some of them abused her too. But the king had left this immortal world in sorrow for his son. 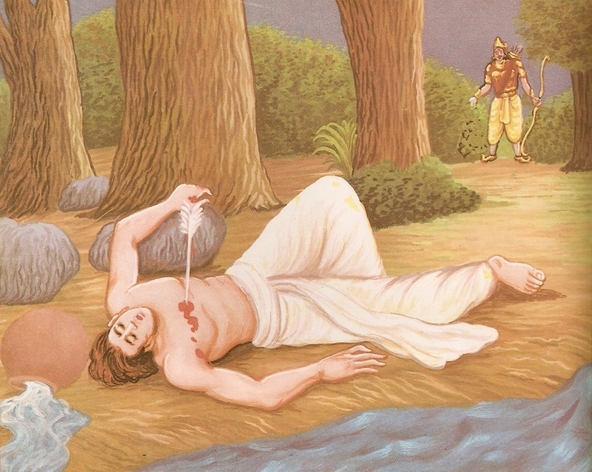 The night passed off and at day-break Saint Vasishtha was informed of the king’s death. 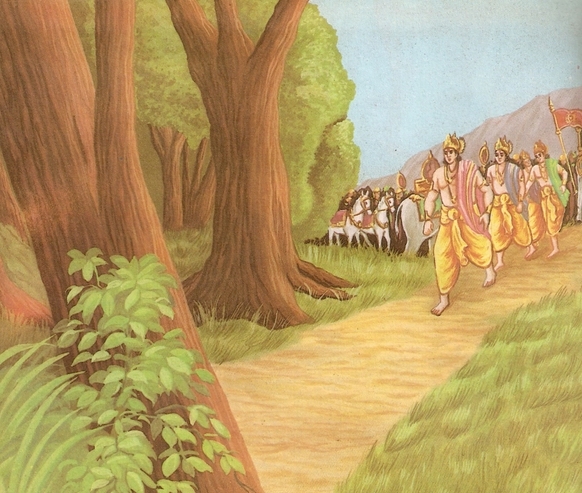 Saint Vasishtha came running to the palace to the palace. He consoled the queens and the ministers with his religious sermons about death which is inevitable. 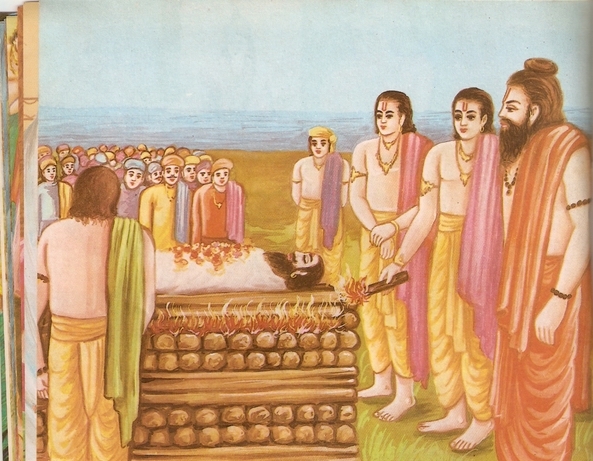 Then he asked Sumant to put the kings body in a boat-like container filled with oil so that it should not decay. 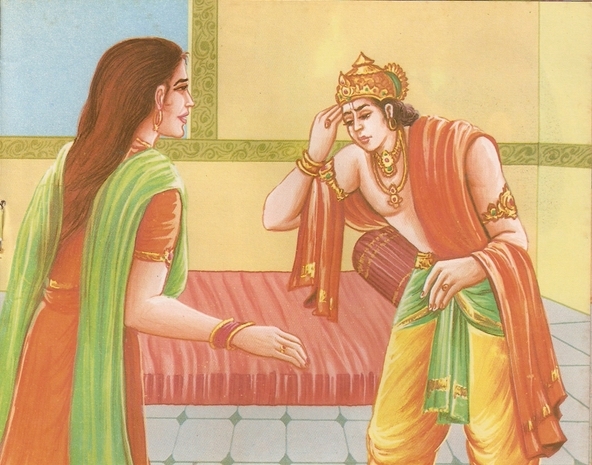 Then Vasishtha sent for a messenger and asked him to go to Bharata who was with his mother’s parents. He advised him not to disclose the news of the king’s death there. 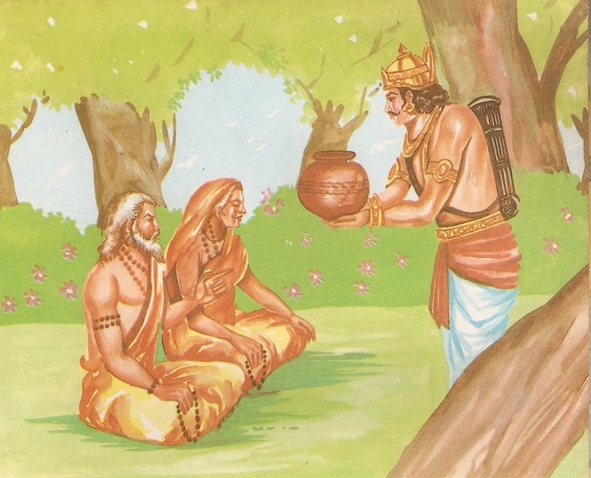 He directed him to inform Bharata and Shatrughna that he (Vasishtha) had sent for them. He was sure they would rush to Ayodhya when they get this message. So, the messenger left for the town where Queen Kaikeyee’s parents lived so that he might bring back the two princes. Now listen about Bharata. He had been seeing ominous happenings since the things had started deteriorating at Ayodhya. So, his mind was always suspicious of some calamity to befall. He often saw bad dreams and so he meditated hard praying to the Almighty for the safety and happiness of all kith and kin. 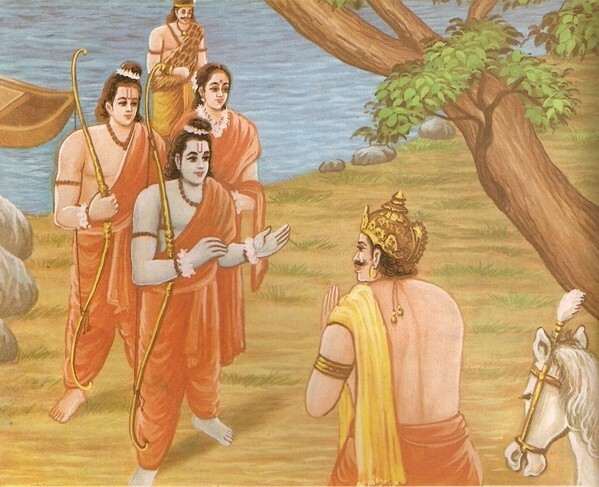 Just then, Vasishtha’s messenger reached there and conveyed the saint’s message that he wanted them both to rush to Ayodhya at their earliest. So, Bharat took leave of his maternal grand-parents and after worshiping his gods he proceeded to Ayodhya in a chariot along with Shatrughna. Their minds were at Ayodhya now. They wished to fly to their home-town indeed. When the two princes reached near Ayodhya, things did not appear well to them. Ominous things like howling of jackals, braying of asses and weeping of dogs happened. On entering the town, they found it plunged in sorrow. The people who came across their way, looked dejected. 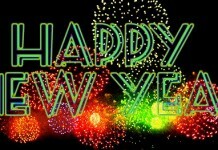 Everyone simply greeted them and went away without uttering a word. 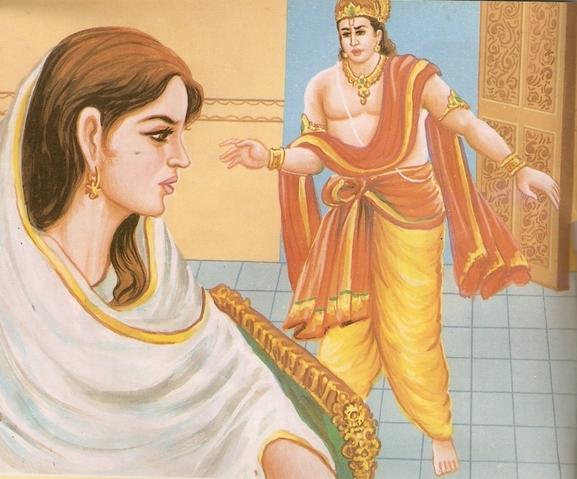 “See your mother first of all,” replied the prince-consort, “She must be eagerly waiting for you.” Saying so, Mandavi left the place and Bharata made for his mother’s palace. “Yes, everything is all right there, But what about here? How is father and the other two queen-mothers. Are my elder brother and his wife Sita all right? 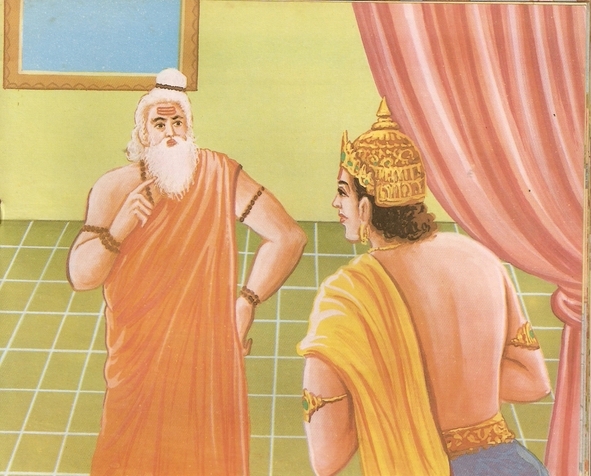 Where is Lakshmana, my brother?” Bharata put a volley of questions to Kaikeyee so that he might know the reality. Hearing her son’s queries, Kaikeyee filled her eyes with crocodile tears and said, “You know, it was I who safe-guarded your interests well in time. Manthra too helped me a lot in this task. But one sad thing happened that your father died suddenly. 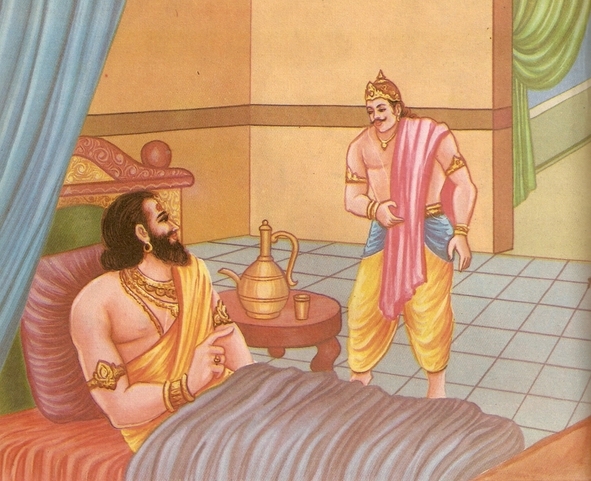 Hearing about the death of his father, Bharata began to bewail bitterly. He asked his mother to explain how the death had occurred. Leaving Kaikeyee’s palace, both the princes went to Queen Kaushalya’s palace. Seeing the king’s corpse there, they began to bewail bitterly. “Yes sir,” said Bharata. He got up with a heavy heart and ordered Sumanta to make preparations for the last rites of the king. The pyre was ready in no time and the last obsequies of King Dashrath were performed in keeping with the directions given on religious scriptures. Everyone supported Bharata’s suggestion and so Sumanta made arrangements for the march to the forest just as Bharata had ordered. 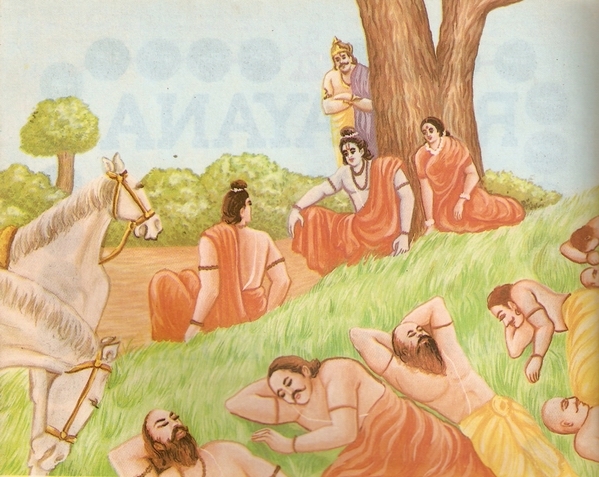 Next day, Bharata left for the forest accompanied by his kith and kin, nobles, ministers, and Saint Vasishtha. Articles to be used for the coronation were also carried along. King Janaka, Sita’s father, too joined Bharata in this great march along with his kith and kin and soldiers. “NO, never, Lakshmana; your doubt is unfounded. Bharat is very righteous. 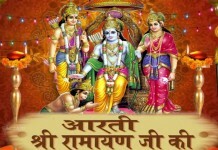 He cannot do like that Let him reach here and you will come to know of the reality,” said Rama serenely. 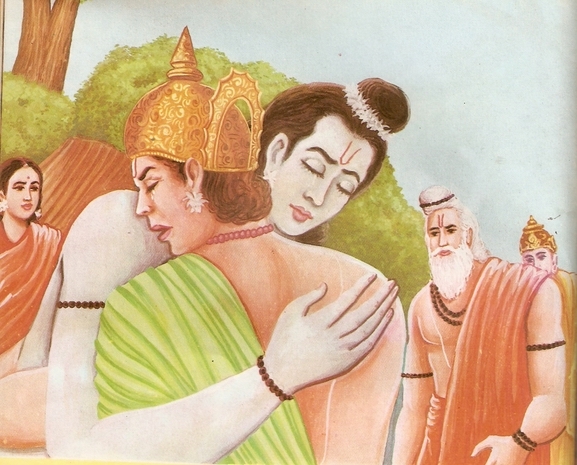 So, Lakshmana begged for Bharata’s pardon who embraced him too. 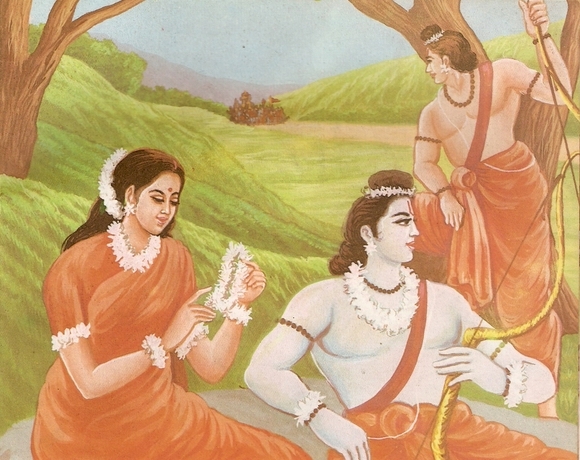 Then paying his respects to Sita, Bharata expressed the purpose of his visit. Just then came there all the three widowed queens. 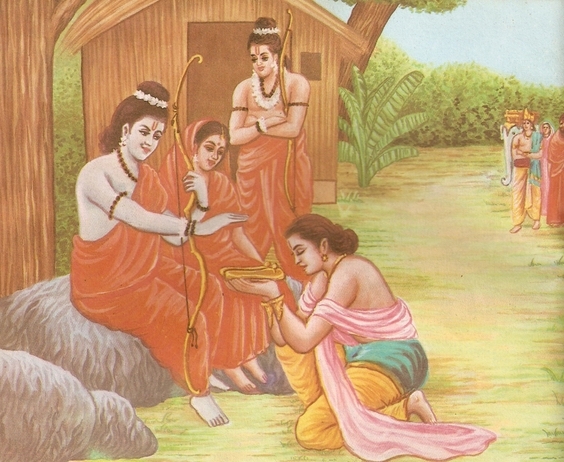 Seeing them in widows’ dresses, Rama began to bewail bitterly. “I can never do so, dear brother,” retorted Ram. “But why after all?” asked Bharata. 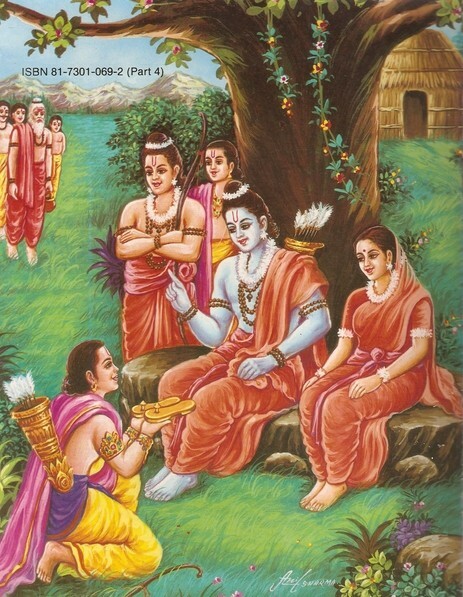 “Because I am bound by the boons given by dear father to Mother Kaikeyee,” replied Ram. “If a person must live in exile for fourteen years to keep the boon of dear father, I am here to do it, “suggested Bharata. “No, dear, Bharat, according to his boons, I am to live in exile while you are to mount the throne. So you must run the government till I am in exile,” argued Ram. “All right; if this is your wish, I must run the administration but in your name only. These wooden shoes of yours will be placed on the throne as a token.” Saying so, Bharata returned to Ayodhya with Ram’s wooden shoes.